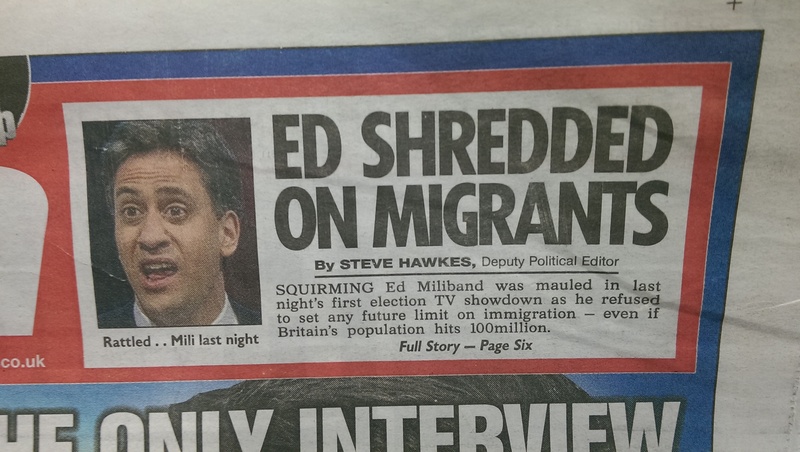 For a newspaper so confident in the virtues of David Cameron and the ‘weakness’ of Ed Miliband, the Sun goes out of its way to lean on the scales. 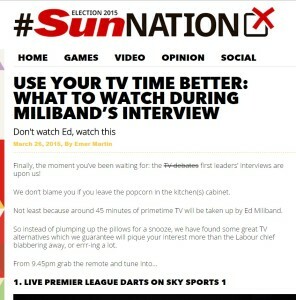 Yesterday the Sun’s online election guide, Sun Nation, ran a story telling readers to switch channels during Miliband’s interview in last night’s ‘Battle for Number Ten’ programme, shown on Sky News and Channel 4. 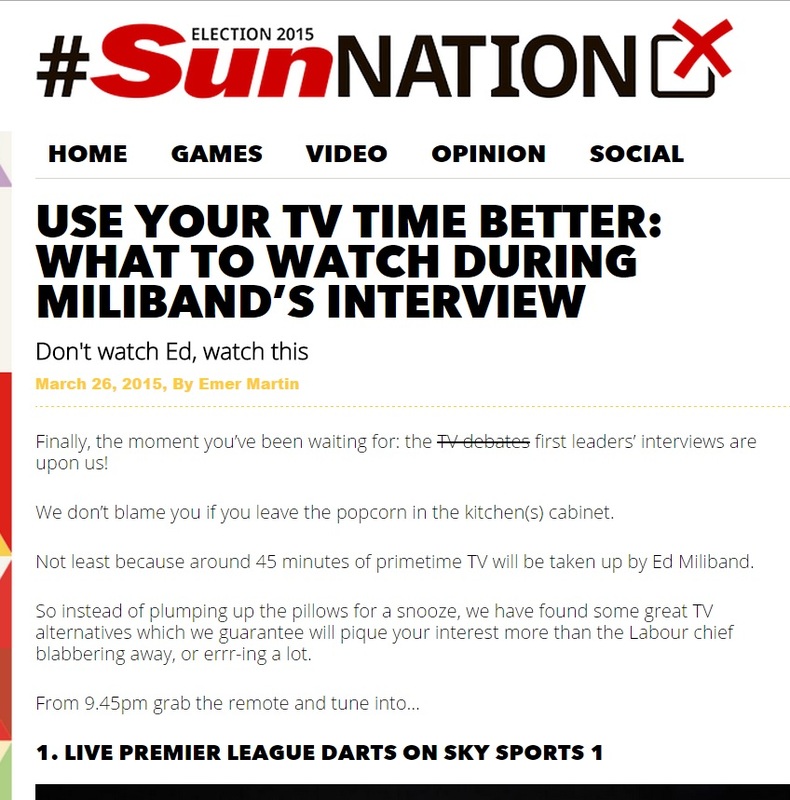 The website, which has portrayed the Labour front bench as zombies, encouraged readers to ‘use their TV time better’, suggesting five other things they could watch instead of the leader of the Labour party. 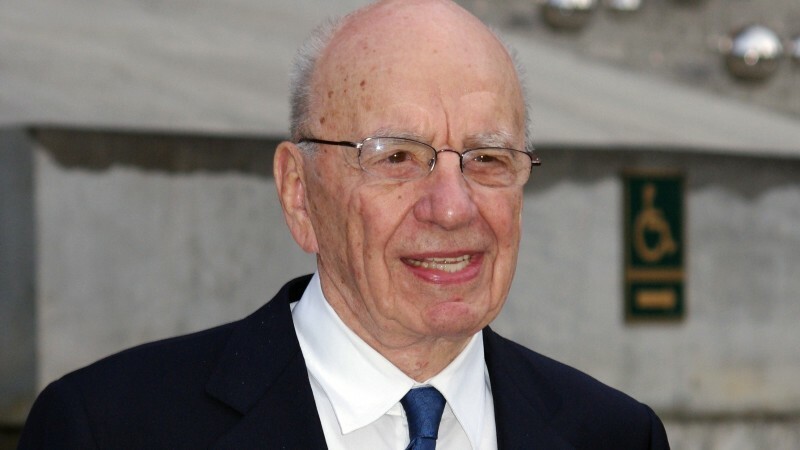 Two of the suggestions were on channels part or wholly owned by Sun proprietor Rupert Murdoch. The first was live premier league darts on Sky Sports 1, while number five was reruns of the cartoon Family Guy on Murdoch’s Fox TV. The others were the film Alien on SYFY, a documentary about the Incas on BBC Four, and reality show Geordie Shore on Viva. In other words, the country’s best selling newspaper suggested readers watch the prime minister’s interview, then turn over when the leader of the opposition comes on – preferably to a channel part-owned by Rupert Murdoch. Or perhaps the people running Sun Nation are simply acting on their own initiative, but in keeping with the general wishes of the proprietor. Either way, Mr Murdoch still bears responsibility for such low behaviour, with his newspaper trying to prevent the public from seeing both party leaders and making an informed decision on how to vote. This latest dirty trick ought to be recognised as a direct intervention by a right-wing businessman in British democracy. I struggle to remember how many times I have had to re-post this link on this site. The BBC does NOT have a Labour/leftwing bias. It has an establishment bias. Also calling all academics lefties is nonsensical I would suggest it shows how little you know of higher education and universities in general. And that’s why you’re on meds in the first place. Keep screaming that I have your issues, LB. I call you and your multiple usernames, with the same old insults, you – Lord Blagger. You have, as you admitted, a brain injury (“half a brain”), and you seem to revel in it. “JEWS R ILL” now, I see. Just logic and English, quite literally foreign topics for you. No, I’m not you LB. As you demand I waste my time re-reading perfectly good English to cater to your poor English skills. Yes you are, LB. Thanks for admitting this clearly and for the record. As you make up nonsense about badges, talk about honour (a concept you clearly don’t understand) and scream that a moderate left winger is “more than anyone else”. Nope, I don’t have your need to big yourself up, get over it. “This latest dirty trick ought to be recognised as a direct intervention by a right-wing businessman in British democracy.” ….swap “malevolent foreign national” for businessman and it is even more accurate. Hahaha! Take it easy, Leon. You haven’t answered either question. Making fun of lost sheep is easy anyway. Maybe Murdoch is secretly supporting The Do Everything Party ! !